With January coming to a close, so is resolution season. Hope may still be alive for some as they push past procrastination and fatigue, but for others the “new me, new year” has been put on hold until 2020. For those still trekking on in your quest for a ” summer body,” I have compiled a two-part series consisting of six classes to help you navigate the exercise classes offered at the Pohl Recreational Center. As previously stated in part 1 of the series, the rec offers a $5 individual class pass and a $25 pass that gives students and existing gym members unlimited access to all of their group exercise classes. One thing to keep in mind is that most classes close their doors right at the starting time on the schedule. So, I recommend arriving about five minutes early for guaranteed entry. Those who are not ready to commit to the unlimited pass or pay the individual class fee are in luck. The rec center offers a few of its classes free of charge to its existing gym members and Step Express just so happens to be one. Like Zumba, Step Express is a routine-based workout class consisting of repetitive steps with interchanging combinations. What to expect: Step Express is a class that requires consistent attendance in order to get the best out of one’s workout. As a first-timer, I spent most of the class tripping over my own feet and standing in utter confusion as I tried to figure out the instructor’s moves. According to the instructor and seasoned attendees, the steps always stay the same while the combinations in which they are done is what changes. So, the more often that an individual attends,=- the easier the class becomes. Time: Fridays from 12:15 to 12:45 p.m. Packed with burpees, planks and suicides, HIIT is eerily reminiscent of a high school gym class. But unlike high school, there isn’t an option to walk laps around the gym or blow off the exercises. This class is the most mentally and physically challenging on the list, therefore I don’t recommend it to those not willing to push through their own limitations. I definitely do recommend bringing a friend, it definitely helped a lot to have someone to laugh with and cheer you on in the midst of mutual pain. What to expect: After warm-ups, the class is broken up into several groups which are then assigned to a workout station. Within each station, there are exercises done in intervals of two before the groups are instructed to rotate to the next station. Throughout the class, the instructor makes an effort to learn the names of his attendees in hopes of motivating them even further. It is extremely imperative to stay hydrated in this class, so I suggest drinking plenty of water before, during and after the class. Time: Tuesdays and Thursdays from 5:30 to 6:10 p.m. 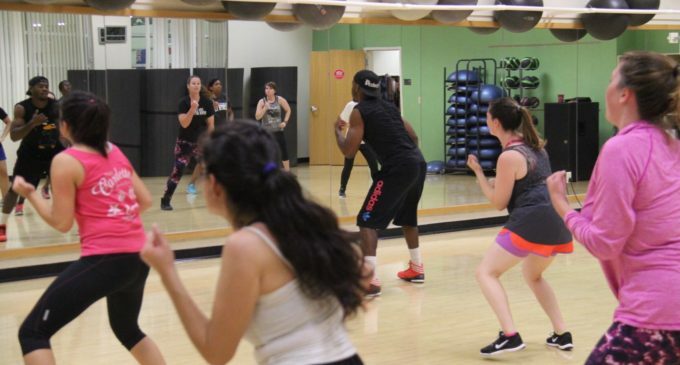 The rec’s website describes Dance Fitness as “A pre-choreographed dance class.” With that description in mind, I expected the class to focus on teaching a set of dance moves that would then be performed as a whole. Instead, I was surprised to find that the class is essentially Zumba’s twin sister. It has a different name, but it’s essentially the same thing. What to expect: Most of the instructors that teach Zumba are also the ones that teach Dance Fitness. Time: Thursdays from 6:45 to 7:45 p.m. and Saturdays from 10:15 to 11:15 a.m. Featured Image: Students participating in an exercise class at the Pohl Recreation Center. Courtesy Facebook.